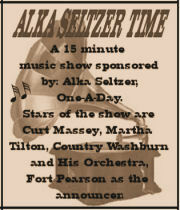 Here we bring you Alka Seltzer Time, which was a 15 minute Music show sponsored by Alka Seltzer and One-A-Day. 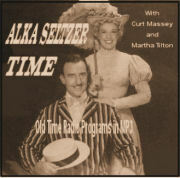 The stars of the show are Curt Massey, Martha Tilton, Country Washburn and His Orchestra, Fort Pearson, the announcer. Ads described the show as "informal song sessions" by vocalists Massey and Tilton, who was often billed as "the liltin' Martha Tilton." The two singers, both Texas-born, performed with Country Washburne and His Orchestra, featuring Charles LaVere on piano. Songs included such tunes as "Honey, I'm in Love with You," "A Gambler's Guitar," "Just to Be with You," "Moonlight When Shadows Fall," "When Love Goes Wrong," "Choo Choo Train," "I've Got Spurs that Jingle Jangle Jingle," "Put on a Bonnet," "Collegiate," "On the Sunny Side of the Street," "Papaya Mama" and "Istanbul, Not Constantinople." The First Show aired on October 9, 1953, and the last show on November 6, 1953, a relatively short-lived radio show program. Now let's hear Alka Seltzer Time !